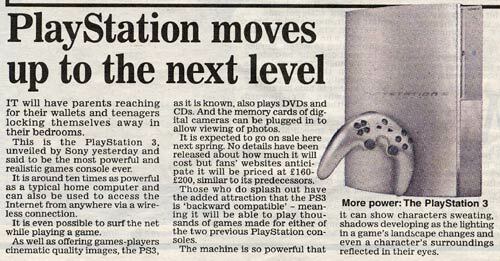 Every gamer’s favourite newspaper, the Daily Mail, took a leaf out of everyone’s book with a little piece of coverage on the PS3. I saw no mention of the Xbox 360 so I can only assume that Microsoft employs too many young gay Labour-voting Muslim gypsy asylum seekers to qualify for coverage in their “news” paper. I’d love to know which sites they “researched” in finding a rumoured £160-200 price point because not only was the PS2 £300 at launch, not £200, but I’ve yet to see anyone even entertaining the notion of a sub-£300 price point at the UK launch. Two minutes with Google could have turned up that information, but obviously it’s quicker and more profitable just to make it up and assume that your audience doesn’t know any better.